BANGI, 14 Feb 2014 – The University of Reading (UoR) in the United Kingdom wants to carry out research with The National University of Malaysia (UKM) in literacy and the ability of Malaysians to be bilingual or even tri-lingual. 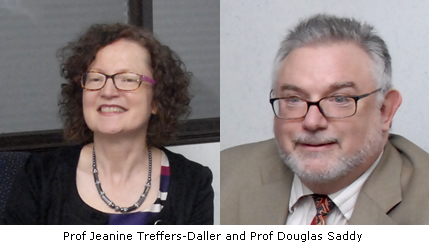 The UoR’s Profs Jeanine Treffers-Daller and Douglas Saddy told the UKM News Portal that the Malaysian university has the relevant experience and data on linguistics and Neurosciences that the British University can learn about. Speaking after signing a Memorandum of Understanding (MoU) with UKM here today on research partnerships, Prof Treffers-Daller, who is Director of Centre for Literacy and Multilingualism said UoR is interested in how Malaysians with different mother tongues such can learn to speak Malay and English as the languages do not have common origins. She explained that in the UK relatively few people – other than the migrants – who are bilingual, let alone speak three languages. “In the UK and Europe Britons find it hard to even learn European languages that have common roots. We want to know why Britons are not inclined to be bilingual. This is where UKM can help,” she told the UKM News Portal. She said UoR and UKM hope to develop tests for different languages and use them to assess programmes in languages. The tests also have a clinical stage where the multilingual context is studied. She wants to find out with UKM’s help how Malaysians can learn Malay as children as well as adults. She added that joint research would be done in the UK and Malaysia and the data compared. The results would then be published. Prof Treffers-Daller is a convenor of the Second Language Acquisition Research Group in Britain and teaches Second Language Teaching and Learning. She also measures bilingual language proficiency and second language acquisition. Prof Saddy, who is UoR’s Director of Centre For Intergrative Neuroscience and Neurodynamics, wants to study how learning of language by Malaysians affect the brain and the nervous system. He intends to do research on changes in brain structures associated with second language learning among Malaysians and compare it to studies done in the UK and Europe. He said doing computational analysis of languages is tough, especially in people who are multilingual and have hearing problems. “The UoA has the software and techniques that we can use in our research but we also need the input that UKM has in teaching languages to people who have auditory issues,” he explained. He stated that both universities should innovate on methods to study the complex subject of multilingualism and language impairment in multilingual students. Prof Saddy had studied language processing for European languages such as English, German, Danish, Dutch, Basque and Spanish.